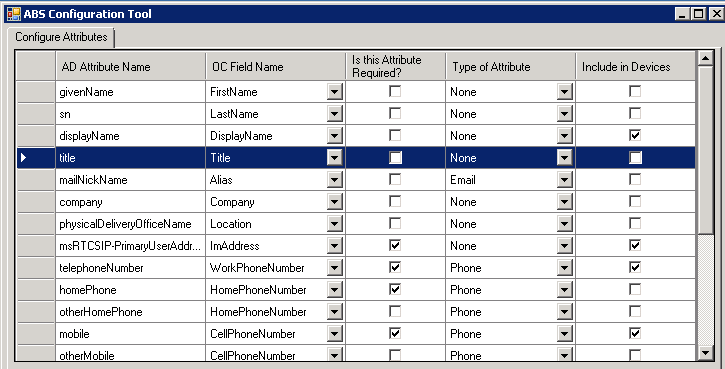 Lync Server 2010 shows several properties on contact cards within the Lync 2010 client by default. You can customize this by using a Lync Server 2010 Resource Kit Tool. We will manipulate the contact card with the Address Book Service Configuration (ABSConfig) tool from the Lync Server 2010 Resource Kit. ABSConfig is an administrative tool that helps administrators customize Address Book Service configuration in Microsoft Lync Server 2010. 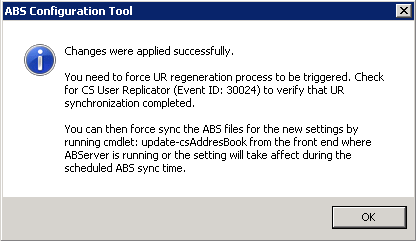 It also allows Lync Server 2010 administrators to restore the default Address Book Service settings. 2. Click on the row(s) for the attributes you want to remove from the Address Book, and then click on Delete (on your keyboard) – thats right!!. In my example, I will delete the Title attribute. 5. Now run Update-CsAddressBook cmdlet from powershell to force the Address Book server to update. 6. After the client address book has been refreshed, you’ll notice that the Title is no longer visible for the same contact in the Lync Client.